We love coming up with different tea towel designs. They can be perfect hostess gifts for dinner parties you may be attending, and they are a super easy way to transition your home with seasonal decor. 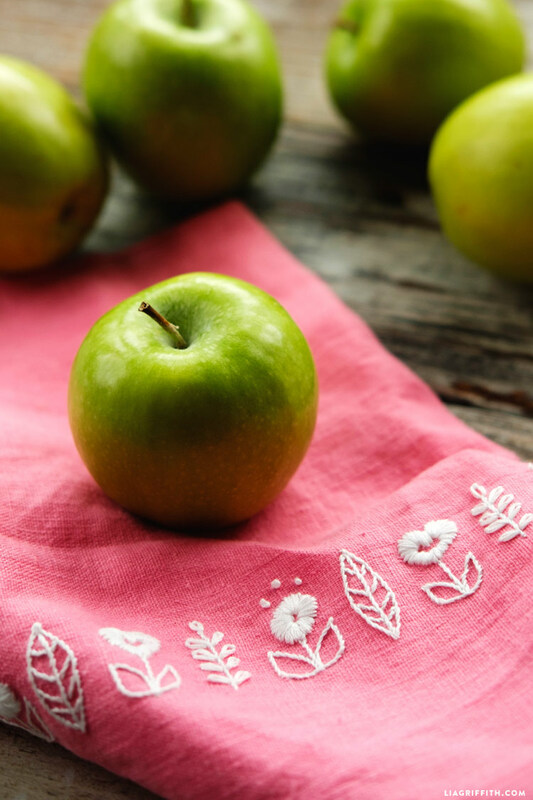 To make your own tea towels or napkins with custom designs, we usually recommend creating an iron-on pattern or personalizing with paint. Before you can do this, though, you need to get your tea towels. 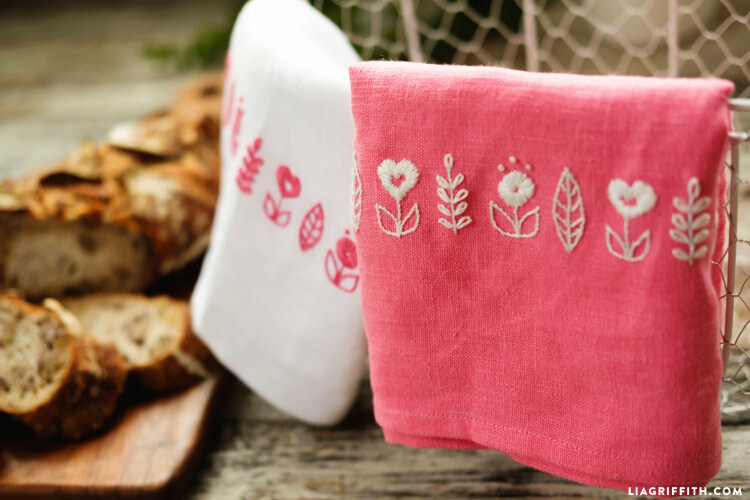 There is a great selection of tea towels at home goods or kitchen supply stores like Sur La Table, but they are not always the most affordable. Because we believe in the power of DIY to make your life better and easier, of course we had to come up with a way around this! Today we are going to show you how to make your own set of tea towels from linen that you can pick up from your local fabric store. Serge or zigzag cut edges and prewash fabric. Press with an iron and fold the fabric into quarters. Using a rotary mat, cutter and ruler, square up the serged edges. Next, trim off as little as possible on both folded edges and selvedge. You should now have 4 identical rectangles. Fold and press the first side up a 1/2-inch. Fold over again and press. Working counter-clockwise, fold and press the next side over a 1/2-inch. Fold over again and press. Open pressed folds on the second side and fold corner up to the press fold line (shown as a dotted line). Refold the second side and press the first fold. Refold the side again, creating a folded mitered corner. Press and pin to secure. Repeat steps 6-9 counter-clockwise around the remaining sides and corner. This is one of those projects that is best explained visually, so be sure to follow the photo tutorial below for help! Start by choosing your linen – you will be able to make 4 towels per yard. We found our European linen on fabric.com (links in Shop this Project). There are a few different types of linen you can buy, so pay attention to if you need to prewash your fabric or not. 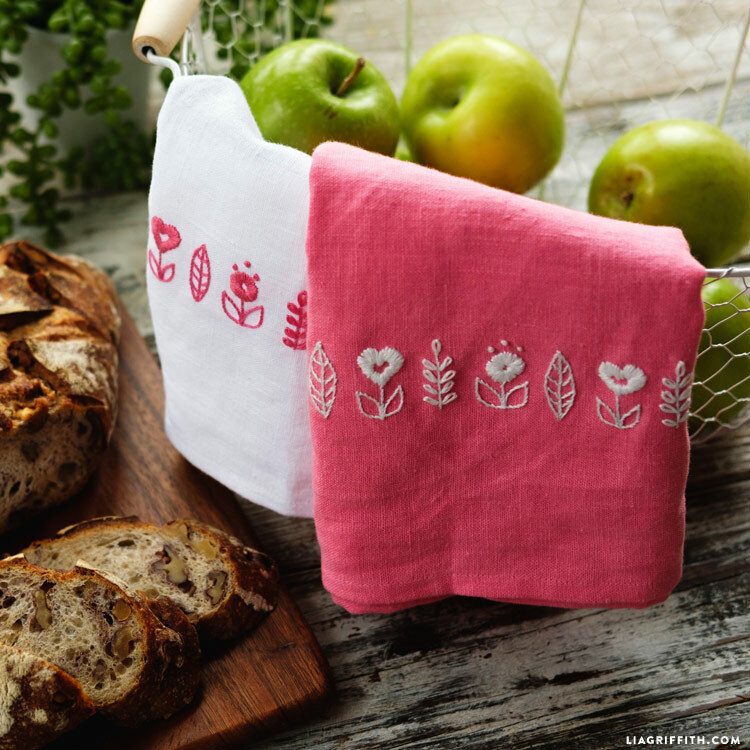 After you make your own tea towels, you can add any designs that you’d like! Browse through all of our DIY tea towels for inspiration. We decided to embellish this particular set with some pretty embroidery. 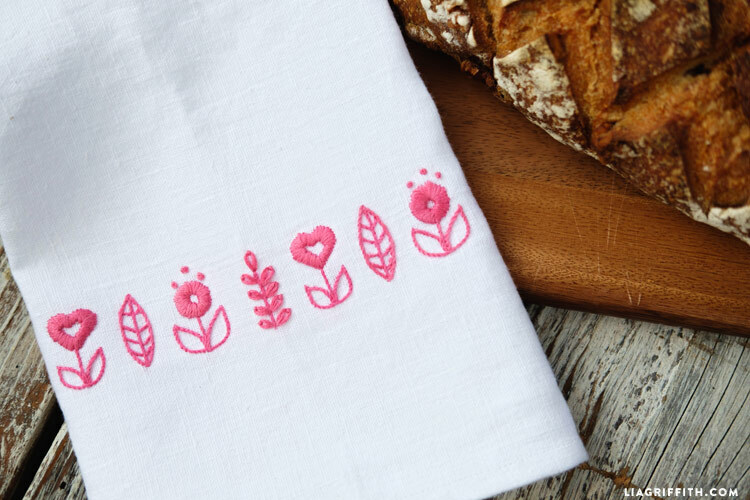 Find our series of embroidery videos to show you how to create this design yourself! There is a video for each stitch, plus instructions on how to transfer patterns to your fabric. You can find an iron-on variation of our embroidered pattern here. The word is selvedge, not salvage. I’m sure autocorrect “fixed” it for you the same way it changes sewing to seeing every time I type it! I just found this on Pinterest and I’m happy. Will buy 2 yards of linen and try this tomorrow. Good opportunity to try out those decorative stitches on my sewing machine. Thanks for the tutorial all the way from Jamaica. Is one layer of linen work okay? I was worried that the white linen might look too thin. It depends on the linen you find– mine was thick enough for 1 layer. The link to get the pattern and instructions seems to be broke and I can’t access it. Hi Sue, I just double-checked the downloads and they’re working fine on our end. You might want to try a different web browser– and if you still have trouble, send an email to hello@liagriffith.com!